Join us for programming in association with Weapons: Beyond the Blade. The Up Close and Personal tour series gives visitors a glimpse of members-only perks by exploring exhibit topics, artifacts, and related items from the Museum's collections up-close. 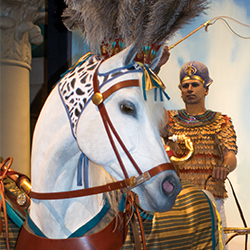 Don't miss these exclusive programs in our permanent exhibits and behind-the-scenes areas. RSVP: Required; call 414-278-6170 or 888-700-9069. Reservations will begin in March 2018. See some of the Milwaukee Public Museum’s most intriguing items at MPM Inside Out. For Members & Member Guests Only! RSVP: Required; call 414-278-6170 or 888-700-9069. Have some spirited fun at the Milwaukee Public Museum during Halloween Hauntings. Enjoy free admission at participating museums, twice a year, on Member Swap Day. Member Swap Day gives you free access to six local museums. Explore museums across the city with family, friends, or anyone covered by your membership.